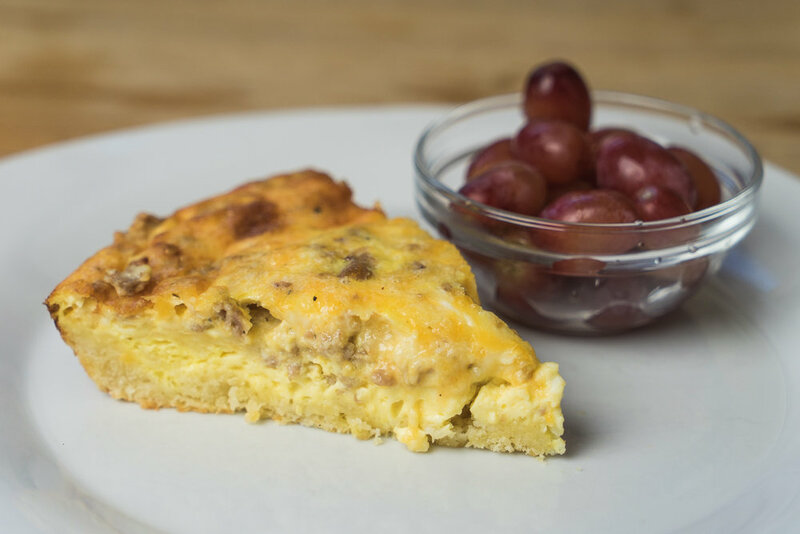 Have you ever woken up in the morning and just craved a really good breakfast dish? Piping hot, meaty, cheesy, eggy goodness? Well I do quite often and sometimes I can get motivated to whip up a fresh crust and make a quiche. Then there are those mornings when I crave the goodness, but just want to lounge in my pajamas with coffee and not work hard in the kitchen. A morning like this is how this recipe was born. I wanted a quiche, I did not feel like making crusts or venturing out before coffee to get crusts so I thought and thought and thought until I remembered about drop biscuits. On nights when I am in the mood for bread but did not remember to bake any or my store has sold out of loaves of good French bread, I will pull the few things needed together and make drop biscuits. They are the best because you just mix and plop. No kneading, no rolling, no fussiness and you still get all that bread-y goodness. 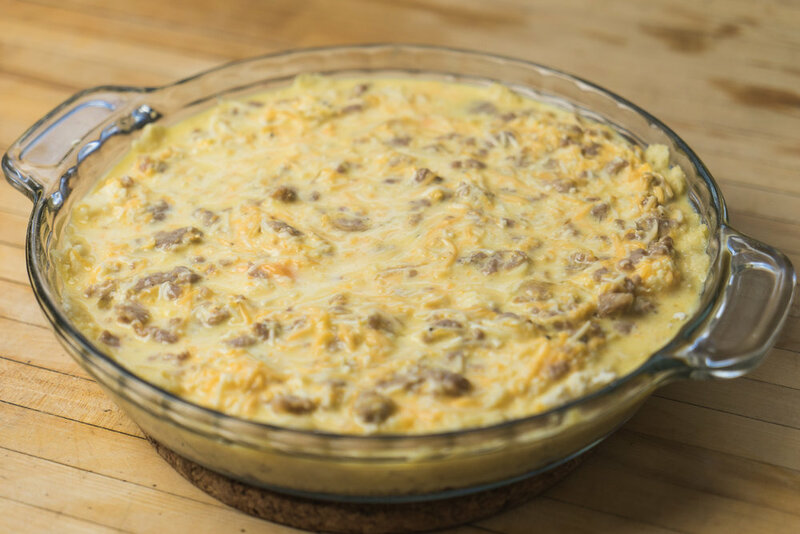 For this recipe I took the ingredients for drop biscuits, greased up a pie dish (casserole dish works too), pressed the biscuit dough into the pan, topped with my yummy egg mixture and presto! Breakfast bake goodness with so little fuss! Which is perfect for those post-Thanksgiving guests you may still have around. Feed a crowd without turkey leftovers and without major time in the kitchen! Happy holidays indeed! Cook sausage in skillet, breaking up as best as you can. Drain as much fat as possible and set aside. Allow to cool for 5 minutes, slice and serve! This is one of those recipes that is really not a recipe, more of a jumping off point for what you like. You can replace the sausage with bacon, chorizo or no meat at all! You can add veggies (onion, green pepper or mushrooms would be tasty here!) or none at all. The cheese can be changed up to suit your tastes or other ingredients. The possibilities are really endless! 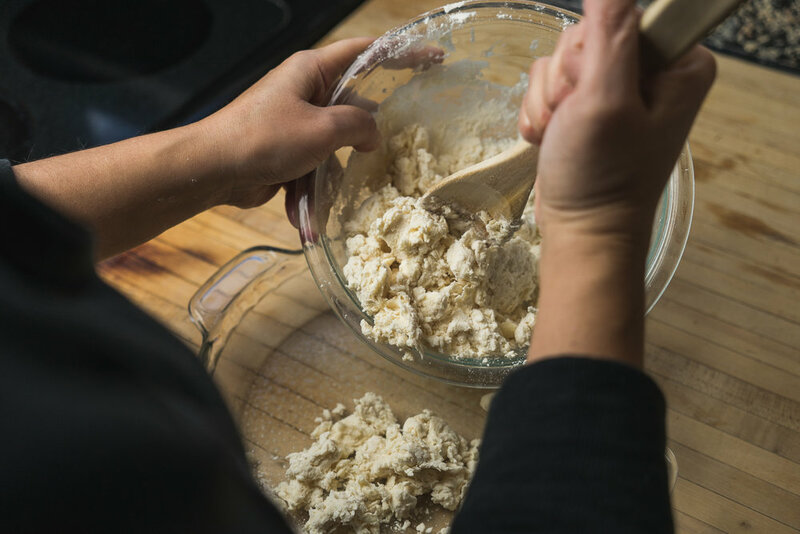 Be sure when pressing the dough into the pan that you press it out an evenly as you can since this will rise up a bit and you want a good and even crust, not a huge lump of crust on one side and nothing on the other!